If you’ve ever wondered what’s wrong with American commuter rail, take a good look at the two parking craters facing off today for a spot in the Parking Madness semi-final. They are within the orbits of San Francisco and New York, offering convenient access to two of the nation’s largest job centers. But even though housing is constrained and increasingly unaffordable in both regions, these commuter rail stations are surrounded by fields of car storage. 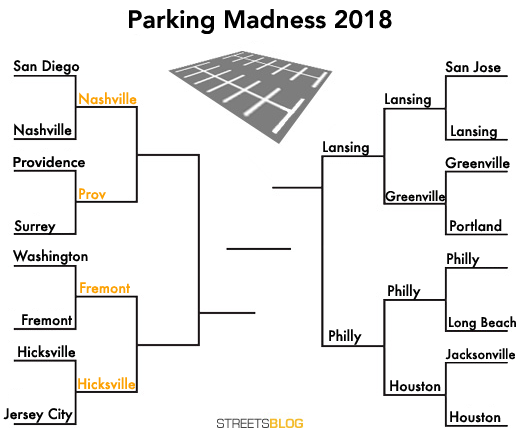 With Lansing and Philadelphia through to the next round and voting still open in the Nashville vs. Providence match, the winner of today’s contest will represent the nation’s transit station parking craters in the Final Four. Watch as Fremont’s BART station area takes on Hicksville’s Long Island Railroad station area. 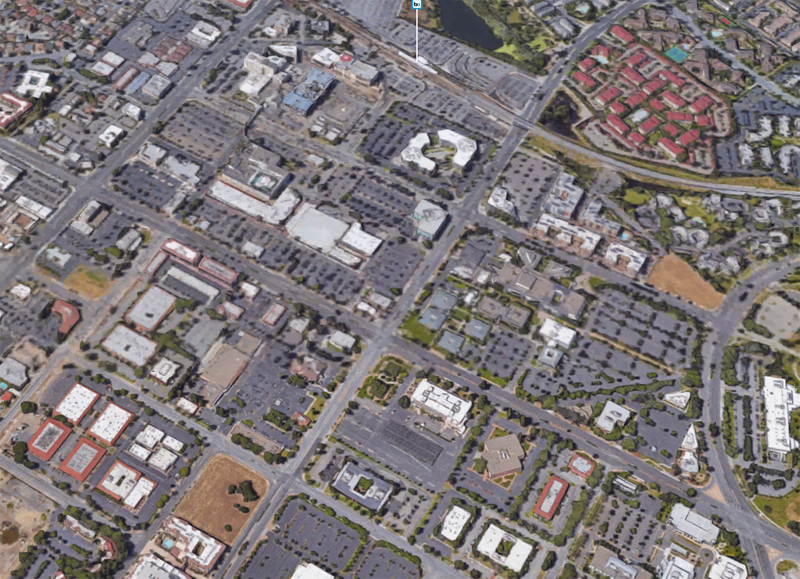 This kaleidoscope of wasted space is directly south of the Fremont BART station. Fremont (population: 214,000) is one of four (!!!) BART stations that have been featured in Parking Madness over the years. Suffice it to say that land use is not a strong suit in these Bay Area commuter rail suburbs. The whole region, but especially higher-income suburbs, have been notoriously resistant to the construction of more housing, even as a booming job market intensifies housing pressures and sends prices skyrocketing. Plans are underway to extend BART service south to San Jose — but it won’t be cheap. Meanwhile, past transit investments are squandered on these unwalkable parking craters. No wonder California is having trouble meeting its climate targets. The Northeast can’t really claim the high ground. Hicksville, on Long Island, is a 25-mile train trip from New York’s Penn Station. But there’s been no effort to create a walkable environment around this LIRR stop, as all that nearby big box retail parking attests. Combined with rigid commuter rail scheduling and crummy local transit service, the land use around this and other LIRR stations keeps ridership very low compared to regional rail systems in Europe. We’ve surveyed the damage, and it’s time to choose which one of these craters should move on to the Final Four. BART is notorious for being a major provider of parking in the suburbs. Many of the suburban stations are designed to be easy to access by car which means that they are not so good to access on foot or bike. The upside is that like most parking craters those BART parking lots could be repurposed for TOD, so long as the local communities are on board. I’ve used both of these stations. I think Fremont objectively wins. Fremont was until recently a terminal station. Even now not all trains continue to Warm Springs. BART may eventually convert some of its parking to housing like it’s doing at other stations, but for right now Fremont has vastly more parking. Though most of that is for the malls to the south. Hicksville (if I recall correctly) seemed to be pretty dense as soon as you got out of the station’s parking lot. And you didn’t show the Fremont ACE/Capitol Corridor staton which is not far away but yet manages to have less parking since it is an older traditional railroad station. I gave it to Hicksville since I used to have to navigate it regularly. Another commenter noted that Fremont used to be a terminal station–how true is that of other suburban BART stations as BART was built out? I’m generally inclined to think that a bunch of parking at end-of-line stations isn’t the worst compromise in the world to get suburban buy-in, but it obviously becomes a problem if you keep incrementally expanding the end of the line out over time, with each one getting that parking concession. These contests always unfairly punish 80s shopping malls, which show up all at once and then are not the easiest things to remove. Fremont is far worse for lacking any kind of plan and consistently developing absolutely nothing next to its station. BART keeps doubling down on parking every time they expand. The new Warm Springs station has 2000 spaces on site and numerous spaces in structured garages inside the supposed TOD, and Milpitas, the next terminal station, will have 1635 spaces. Yes, and it is either cheap or free parking, as well…people have been trained to drive to the stations. Yes, but for the most part, they just keep the parking garages rather than building housing, etc. on them.. even as they build new stations farther out. A particular pet peeve of mine is when they put the transit center in the middle of the parking, especially if the transit center could be located closer to areas that are somewhat walkable even if it meant that some of the parking would be further from the transit center. By putting the transit center in the middle rather than on the edge of a parking area, it sends the screaming message that it’s more important that those that drive to the transit center walk less than those that reach the transit center by other means. Removing much of the parking would be much better still. They can be repurposed for TOD, but BART’s current estimate is that unreserved Fremont station parking fills up by 6:30am every day. Good luck getting local communities on board with what they’ll see as taking away their precious parking that’s already well beyond capacity. What’s wrong with American commuter rail…….other than the fact it’s completely useless. If politicians ever did more than take a first glance at these projects, they would realize that it never works out that way in practice. Costs are a lot higher than expected, and even if you only run a handful of commuter trains a day going a maximum of 40 miles per hour, the feds have added to your costs by requiring you to install the same positive train control systems designed to handle the hundreds of 110-mph trains per day that use the Northeast Corridor. They replace a commuter bus that costs as little as a few bucks to ride. But but but trains are so much cooler than buses! And stuff. Pretty much the argument planners make to build trains when they’re backed into a corner after all their other reasons fall apart under scrutiny. Isn’t Hicksville the site of the original Levittown? No, that would be Levittown. 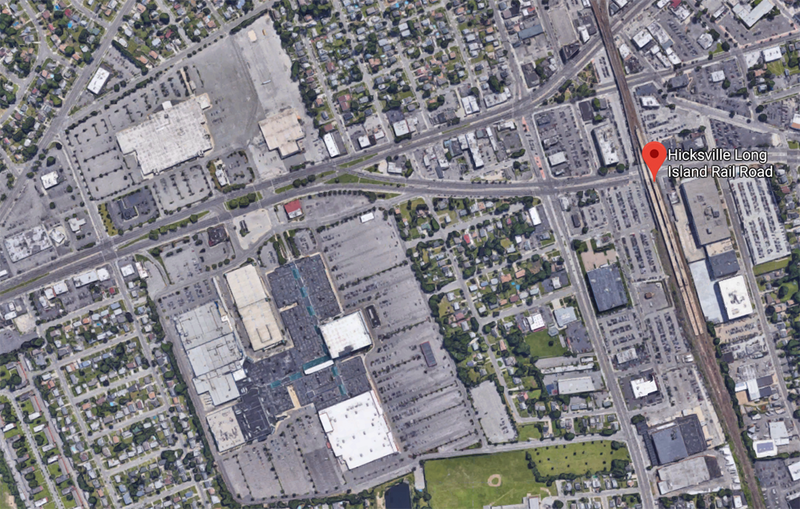 Hicksville received $10million to revitalize downtown to be more walkable. We started off with 16 transit stations, each mired in a morass of parking, and now you can count the number that remain on one hand. A small town commuter rail station takes on a big city subway stop in the first Elite Eight matchup. Which deserves to go to the parking crater championship? The state capitol asphalt acreage or the sports complex mega-lot?